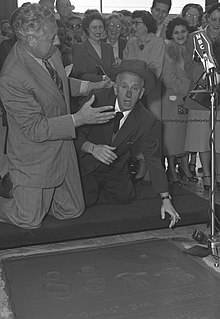 Ezio Pinza (left) jokes with comedian Jimmy Durante as Pinza leaves his imprints at Grauman's Chinese Theater in Los Angeles, 1953. Pinza sang once again under the baton of Toscanini in 1935, this time with the New York Philharmonic Orchestra, as the bass soloist in performances of Beethoven's Missa Solemnis. One of these performances was broadcast by CBS and preserved on transcription discs; this recording has been issued on LPs and CDs. He also sang in Toscanini's February 6, 1938, NBC Symphony Orchestra's broadcast performance of Beethoven's Ninth Symphony. These performances both took place in Carnegie Hall. In March 1942 he was arrested and detained 3 months on Ellis Island with hundreds of other Italian-Americans who were suspected of supporting the Axis. In October 1947 he performed the role of Méphistophélès in Guonod's Faust opposite his daughter, soprano Claudia Pinza Bozzolla, as Marguerite at the San Francisco Opera. Pinza became a member of Westchester Country Club in Rye, New York, and lived in a house adjacent to the fifth golf hole of the South Course. In 1953, he had his own short-lived NBC situation comedy on TV, Bonino, in which he appeared as a recently widowed Italian-American opera singer trying to rear six children. Two of the children were portrayed by Van Dyke Parks and Chet Allen, who had also been with the American Boychoir. Mary Wickes appeared on Bonino as the bossy housekeeper. Then, in 1954, he appeared in the Broadway production of Fanny opposite Florence Henderson. On March 28, 1954, Pinza appeared with Henderson in the TV special General Foods 25th Anniversary Show: A Salute to Rodgers and Hammerstein which was broadcast on all four American TV networks of the time. 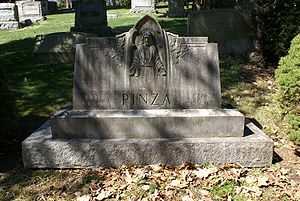 Pinza died on May 9, 1957, of a stroke at the age of 64 in Stamford, Connecticut. His funeral was held at the Cathedral of St. John the Divine in New York City. He is interred at Putnam Cemetery, in Greenwich, Connecticut. Shortly before his death, Pinza completed his memoirs, which were published in 1958 by Rinehart & Company. Photos taken during his career, as well as images of his family, were included in the book. ^ J. F. Clarke (1977). Pseudonyms. BCA. p. 133. ^ "Ezio Pinza - The Official Masterworks Broadway Site". Retrieved 21 July 2018. ^ Jacobs, AD. "Legislation on internment". www.foitimes.com. Retrieved 21 July 2018. ^ "Obituaries: Claudia Pinza Bozzolla". Opera News. November 2017. ^ Snowman, Daniel (1985). The World of Plácido Domingo. New York: McGraw-Hill. p. 135. ISBN 0-07-059527-5. You approach the vast inner sanctum [of the new Met]...maybe pausing for a drink of cool water from one of the inlaid marble fountains 'In Memory of Ezio Pinza'. ^ "Singer Ezio Pinza Dies in His Sleep". The Victoria Advocate. 1957-05-10. Retrieved 2010-05-08. ^ "Amazon.com: Online Shopping for Electronics, Apparel, Computers, Books, DVDs & more". Retrieved 21 July 2018. The Grand Tradition by John Steane, Duckworth, London, 1974. The Concise Oxford Dictionary of Opera (second edition), edited by Harold Rosenthal and John Warrack, Oxford University Press, London, 1980. Liner notes from Ezio Pinza: Bass Arias, Pearl CD, GEM 0061, issued in 1999; and from Ezio Pinza: Opera Arias, EMI CD, CDH 7 64253 2, issued in 1992. Rosa Ponselle was an American operatic soprano with a large, opulent voice. She sang mainly at the New York Metropolitan Opera and is generally considered by music critics to have been one of the greatest sopranos of the past 100 years. Robert Merrill was an American operatic baritone and actor, who was also active in the musical theatre circuit. He received the National Medal of Arts in 1993. Jan Peerce was an American operatic tenor. Peerce was an accomplished performer on the operatic and Broadway concert stages, in solo recitals, and as a recording artist. He is the father of film director Larry Peerce. Cesare Siepi was an Italian opera singer, generally considered to have been one of the finest basses of the post-war period. His voice was characterised by a deep, warm timbre, a full, resonant, wide-ranging lower register with relaxed vibrato, and a ringing, vibrant upper register. Although renowned as a Verdian bass, his tall, striking presence and the elegance of phrasing made him a natural for the role of Don Giovanni. He can be seen in that role on a famous 1954 film of the opera made during an edition of the Salzburg Festival under the baton of Wilhelm Furtwängler. Giovanni Martinelli was an Italian operatic tenor. He was associated with the Italian lyric-dramatic repertory, although he performed French operatic roles to great acclaim as well. Martinelli was one of the most famous tenors of the 20th century, enjoying a long career at the Metropolitan Opera in New York City and appearing at other major international theatres. Richard Alexander Crooks was an American tenor and a leading singer at the New York Metropolitan Opera. Giuseppe De Luca, was an Italian baritone who achieved his greatest triumphs at the Metropolitan Opera in New York City. He notably created roles in the world premieres of two operas by Giacomo Puccini: Sharpless in Madama Butterfly and the title role in Gianni Schicchi. Gina Cigna was a French-Italian dramatic soprano. Tancredi Pasero was an Italian bass who enjoyed a long and distinguished singing career in his native country and abroad. Ettore Panizza was an Argentinian conductor and composer, one of the leading conductors of the early 20th century. Panizza possessed technical mastery and was popular and influential during his time, widely admired by Richard Strauss and Giacomo Puccini, among others. 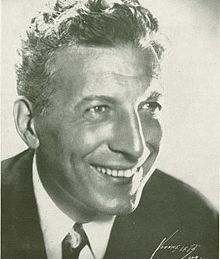 Bonino is an ethnic situation comedy television series starring Ezio Pinza (1892–1957) as an Italian-American opera singer trying to rear his six children after the death of their mother. The program aired on live NBC from September 12 to December 26, 1953. Louis D'Angelo was an American bass-baritone of Italian birth who was particularly known for his performances at the Metropolitan Opera during the first half of the 20th century. He created roles in the world premieres of seven operas at the Met, including Marco in Puccini's Gianni Schicchi in 1917.